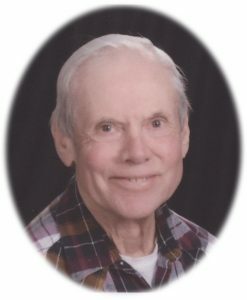 Gary Lee Allen (July 28, 2018) | Burmeister-Johannsen Funeral Home, Inc.
Gary Allen, son of John and Anna (Kolby) Allen, was born on April 22, 1939, at home in Hancock, Iowa. He attended Shelby High School and graduated with the Class of 1957. Following graduation, he studied animal husbandry at Iowa State University, Ames, Iowa. In October 1959, Gary married Dale (Su) Thorngren in Harlan, Iowa; four children were born to this union. They lived in Harlan until moving to his present home in rural Harlan in the late 60’s. On February 3, 2001, Gary married Jan Curtis at the Monroe Chapel, rural Walnut, Iowa. Gary worked for EM Christensen in Harlan for several years during in the 1960s before opening his own business, A&P Appliance. After years of serving customers with a team of employees through appliance sales, electrical, plumbing, and HVAC services through the business in Harlan, he sold the building and moved the business to his home and eventually it became A&B Plumbing. He never really retired and continued to work and serve customers which included providing advice over the phone and on the job. He loved working with people and helping solve problems. He also had a sense of humor that was appreciated by many. The farm which included raising Arabian horses, dairy and beef cattle, goats, sheep, hogs, rabbits and several gardens, helped teach the kids life lessons and kept them busy. He was actively involved in the Shelby County Saddle Club, Boots and Saddle 4-H Club, and served on the Shelby County Fair Board for many years. He also enjoyed hunting and fishing, especially pheasant hunting with family. He made several trips to Canada to go fishing with family and friends. Gary was an active member of the Monroe Chapel. He was proud to serve on the board and help with the recent renovations to the church. Gary L. Allen died on Saturday, July 28, 2018, at his home in rural Harlan, Iowa. Gary was preceded in death by his parents, and one brother, Ronald Allen. He is survived by his wife, Jan Curtis of Harlan, Iowa; one daughter, Kristal Hankins of Council Bluffs, Iowa; three sons, Shane (Pam) Allen of Citra, Florida, Todd (Cathy) Allen of Vandergrift, Pennsylvania, and Nathan (Krescene) Allen of Juniata, Nebraska; one brother, Steve (Mardi) Allen of Spirit Lake, Iowa; one sister, Beverly (Bernie) Zylstra of West Des Moines, Iowa; six grandchildren; three step-grandchildren; one great grandchild; and other relatives and friends. Nate & Family Sorry to to hear of the loss of your Dad, sounds like a hard working guy that I would have liked. May care and love of those around you provide comfort and peace to get you through the days ahead. My most sincere condolences and may God Bless you all during this time of sorrow. So sorry for your loss. Our thoughts and prayers are with you. Rest In Peace Gary! So sorry to hear of Gary’s passing. Wishing you comfort and courage to face the days ahead and loving memories to hold in your hearts. He was a very good man and we were blessed to have known him. Thoughts and prayers.